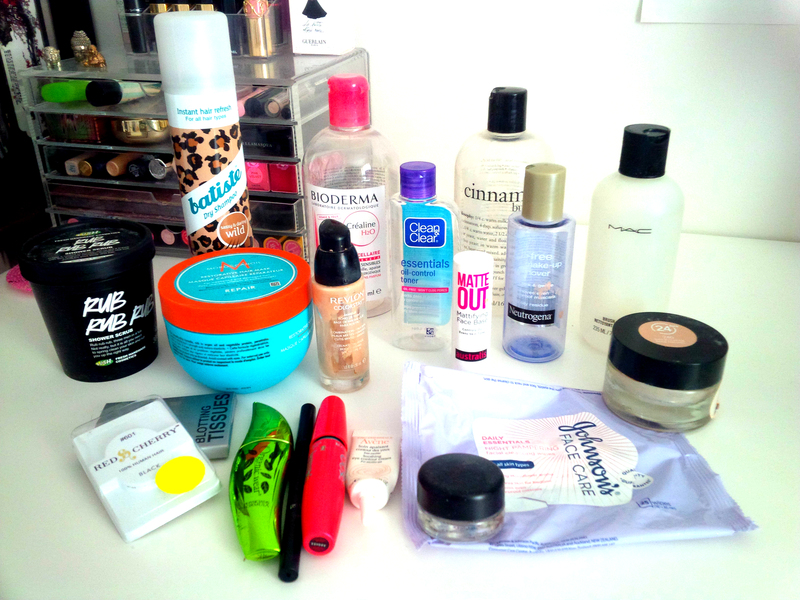 I have been hoarding all of my empty beauty products and it is definitely about time to write an ’empties and review’ post! I love these – it’s interesting to see what everyone is using, loving and wouldn’t re-purchase again. Here are my latest products! Lush Rub Rub Rub Shower Scrub: This was a product that I accidentally picked up – it was sitting amongst the sea salt scrubs and unknowingly I purchased this one and took it home. When I realised that I bought the wrong one – I decided to keep it and give it a go. There are 2 ways that you can use this product – scrub it onto your body prior to hopping in the shower or using it whilst your skin is wet and you are in the shower. I found the first way to work so much better to give my skin a good scrub. It wasn’t a bad product! It did take me a couple of uses to get used to the scent though. Bioderma Crealine: I am in LOVE with this product. This is one of those ‘micellar water’ products and it is fantastic. I was lucky enough to pick up a twin pack of this huge product whilst in Europe for a very affordable price – in Australia, these products go for about $40 a bottle in the 500ml. This product is amazing and one that you can use all of your face, including your eyes. I have actually used this to remove makeup from my eyes whilst they were very irritated and it did not bother them at all. I would definitely recommend and re-purchase. Philosphy Cinnamon Buns Body Wash: When I first purchased this product I absolutely loved it. However, as this thing lasted absolutely forever, it just started to seem to sickly sweet and not at all in a fruity way. It basically smells like cinnamon donuts and baking. I used to be obsessed with this scent in body products and candles but have since grown past and would not re-purchase this product but would possibly try another scent in this range. The actual product itself was great quality, long lasting and it took a zillion years to use it all up! Johnson Facial Wipes: This product was okay but I would not re-purchase. I only picked this up as Priceline had sold out of the facial wipes that I usually purchase. I just didn’t find that this product removed as much make up as other wipes and the towlettes were actually quite dry despite storing them upside down and before even going half way through the packet. It felt like the wipes were more so scratchy on my face and were pulling at my skin and that you really had to rub to succeed in getting any makeup off. Neutrogena Oil Free Make-up Remover: This product confuses me just a little as this is one of those products where it appears as though one ingredient/substance is on top of each other and the purpose of that is to shake the bottle to combine the product and that makes the product even more effective. Usually one half is a type of oil so i’m not 100% sure where the ‘oil free’ comes from. This product worked fine and I have no complaints. I have used eye make-up removers which do not pull as much on my skin so I am definitely still on the hunt for my holy grail. Clean & Clear Oil Control Toner: This was a great toner to use on my oily skin at the end of a long work day. If you have sensitive skin I would stay far away from this product as it is quite strong and also consists of alcohol. It did last for quite a while which is surprising as the bottle is relatively small. I do not have any complaints about this product but would probably not re-purchase as there are soo many toners out there to try! Revlon Colourstay Foundation: I am a fan of Revlon foundations and this one was no exception. This is a product that is a great basic every-day foundation. I would possibly re-purchase but I do totally have my heart set on the whipped foundation. That one is my holy grail drugstore foundation! Moroccan Oil Hair Mask: This is a fantastic product and it made such a difference in the feel and appearance of my hair. I was using this product every single time I washed my hair (every 3 days or so) and would work it into my hair along with my conditioner. I would apply it from about mid-length and all the way through to the ends of my hair whilst making sure to be really generous with it on my ends. If you have split ends – the only fix is to cut your hair but this product will help maintain the health of your hair and is a real treat. Red Cherry Lashes: I am in love with wispy, natural looking lashes. I used this particular pair of lashes about 4 times but you could probably make them longer if you are not applying mascara on top. I have found that every single pair of lashes that I have ever used have lifted at the corners at some point or another whilst using them so I don;t personally see much difference between higher end lashes and more affordable ones like Red Chery. If you are a newbie to lashes – I would definitely recommend to pick up a few Red Cherry ones are they are SO affordable and great to practise with. Physicians Formula Organic Mascara: I don’t usually go for these types of mascaras – the wand was very thick and huge and the actual bristles were made of a rubber material and were relatively tiny. However, I found that after a few test runs – I was able to work out a technique that did infact make my lashes look thicker and longer and was also able to separate them. I bought this after hearing about a recommendation and I don’t regret the purchase! Australia Matte Out Primer: I thought this product was great! My expectations weren’t too high as I have tried out my fair share of terrible primers but this product was quite good. It did make my skin feel nice and matte and smooth which gave me a great base for my foundation. I did still find that my face was oily throughout the day but that is just my skin type. This product will not keep you matte throughout the whole day but will work as a great primer. Maybelline One by One Mascara: Oh how I love love love Maybelline mascaras. If you are a fan of nice subtle lashes and hate that ‘spider leg’ look then you should definitely check this product out. I found that the wand did not pick up too much mascara at any one time and you won’t end up with big blobs of it on your lashes like you will find with other products. I found that this was a great everyday mascara and perfect for work. That being said, I would not re-purchase only because I feel like Maybelline are always bringing out a new mascara and I always want to try them all! Stila Liquid Eye Liner: This product is also a huge favourite of mine. I was in the market for a liquid liner after going through one of MACs gel liners and this product is amazing. It is so black that you only need one swipe of product. You do not need to build this up and if you have already applied a primer – there is no need to re-apply this product throughout the day/night. I have already purchased a backup and will continue to re-purchase this – I may even pick one up in brown! What are your latest empties? Have you used any of the above? What are you currently loving? Let me know your thoughts! I love Moroccan Oil Hair Mask! It’s a lifesaver! Thank-you!! No I haven’t tried it just yet but would definitely love to. The mask was a really beautiful product! Very comparable to the Macadamia Mask 🙂 Thank-you so much for reading! !